This article will outline some of the candidates for the title of the best electric scooter this year. It will also show you some top scooters based on age appropriateness (youngest to oldest) and speed (slowest to fastest). Electric scooters offer a faster alternative than manual bicycles that is also better for the environment than cars. When shopping around for the best electric scooter on the market, there are a ton of options. Thus, it can be an overwhelming task to find a decent scooter to fulfill your needs. For this reason, we put together this guide. What people love about the Razor E200 is the sturdy frame and fork. As a matter of fact, this is what makes it occupy several places on this top. It comes with a battery charger and it’s suitable for all kinds of activities and ages. It’s not that advisable to use it on grass, although it works on dirt as well and it is highly recommended for pavement. It offers a very quiet, high-torque chain-driven m0otor. The twist-grip throttle is also very appreciated by the users. The recommended weight limit is 145 pounds/ 65 kg, while the maximum weight limit is 154 pounds/ 69 kg. The Razor E125 is a great beginner’s scooter that is recommended for anyone ages 8 and over. This scooter can reach speeds up to ten miles per hour. 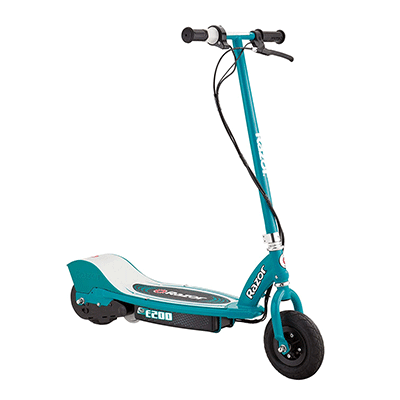 However, like most scooters, it does not start at full speed from a standing position. Instead, you have to manually kick it off so you begin at a speed of 3 miles per hour. This best electric scooter will also give you a full 40-minute ride on a fully charged battery. It is chain driven and has a high torque motor that functions off of a convenient throttle with a twist grip. The Razor E125 is easily stored due to its ability to fold its handlebars. It comes with a set of 12-volt batteries, a battery charger, and a set of maintenance tools. Lightweight and worry-free, the Glion Dolly Electric Scooter makes for a perfect commuter vehicle. 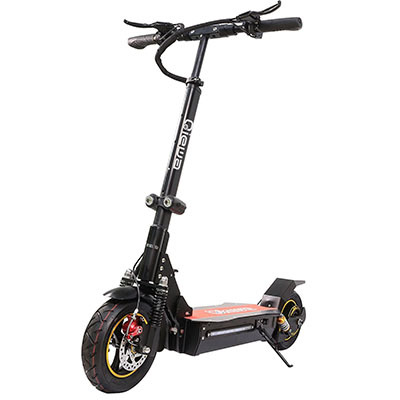 Between the military grade tires, anti-lock brakes, waterproof controls, and battery level indicator you will breeze through the streets smoothly at up to 15 miles per hour. What makes it one of the best electric scooters is that it can quickly and easily be turned into a very lightweight rolling dolly. The Glion is powered by a strong 36v 6.6ah lithium ion battery that pushes along the powerful brushless motor found near the rear wheel. Durability is another terrific aspect of this scooter. It is created with aircraft grade aluminum and has a powder coating to help keep corrosion at bay. 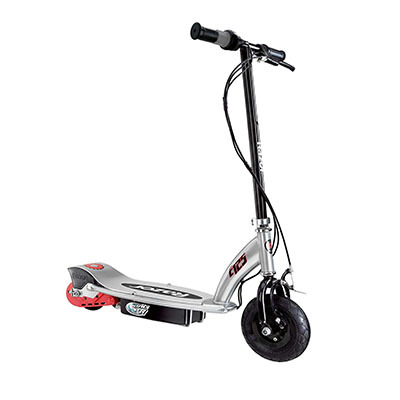 This scooter is so easy to use with its twist grip accelerator on one side and a twist grip brake on the other. 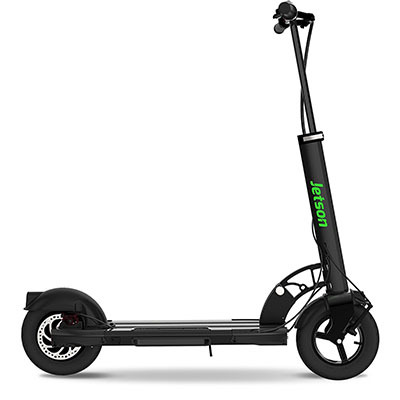 Jetson’s Black Breeze scooter gives you a thrilling ride with up to 18 miles per hour, though you may feel like you are speeding along much faster because of the fact it sits lower to the ground than most other scooters. To help keep you aware of your speeds, Jetson has included a backlit LED display which will remind you of how fast you are going and how much battery power you have left to enjoy. That battery will give you a good 20 mile run on a full charge. You can also feel secure during your ride on this best electric scooter because of the anti-skid hand and foot grips, brake lights, LED headlight, and reflectors. 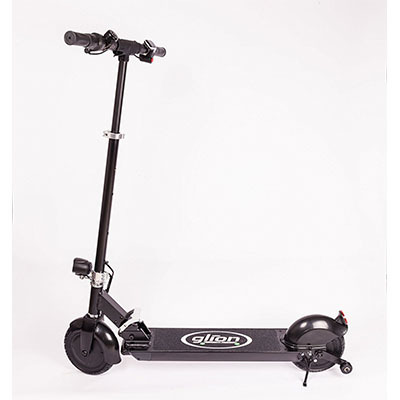 Easily stored and carried, the Black Breeze scooter folds easily and includes a built-in carry handle. The QIEWA Q1Hummer may be heavier than many other scooters but it because so many details were included in its heavy duty frame. First off, you can reach speeds of 35 miles an hour on it. With that speed comes safety features such as high speed tires that help absorb shock and can manage many road types easily. It is also waterproof and able to deal well in not-so-perfect weather you may find yourself in. When not in use, the QIEWA Q1Hummer can easily fold and the onboard security system can help keep it safe. There is even a feature that allows you to place it in a no start position using a remote so that you do not have worry about young family members giving your scooter a try while you are not present. This best electric scooter is higher up on price point but with so much power, added safety features, and packed full of extras, if it is in your budget, it is worth every penny. If you are looking for an alternative method of commuting or just some speedy fun, an electric scooter may be the way to go. This list brings up a few of the best electric scooter on the market currently. Depending on what you need in a scooter, one of these may fit your situation. Do you own an electric scooter? What are your favorite features? Leave comments below to help others looking into purchasing their next electric scooter. Disclosure: There are affiliate links from Amazon in this article and our website may receive a commission for purchases made through the links we shared. This partnership does NOT affect the price of the product, nor does it influence our objectivity, as we only review products we consider high-quality and ideal for all adventure-seekers.